A Beatles Reflection | Humanities. Beatles Radio: The Beatles, Solos, Covers, Birthdays, News The Fab 4 and More! INDIANA “It’s boring almost beyond belief,” British rock critic Nik Cohn wrote of the Beatles’ self-titled album shortly after it came out in November of 1968. Cohn’s brickbat was just one of two negative reviews the New York Times published upon the release of The Beatles. (You probably know it better as the White Album.) Those responses, though, may say less about the record’s virtues than the way it upended listeners’ expectations. On 1967’s Sgt. Pepper’s Lonely Hearts Club Band, the Fab Four polished its pop instincts. 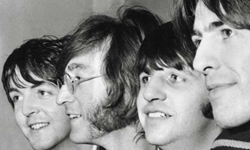 The Beatles, by contrast, was scruffy and centerless, its thirty songs encompassing mock-Beach Boys vocal harmonies (“Back in the U.S.S.R.”), psychedelic folk (“Wild Honey Pie”), proto-punk (“Helter Skelter”), sound collage (“Revolution 9”), and plenty more besides.